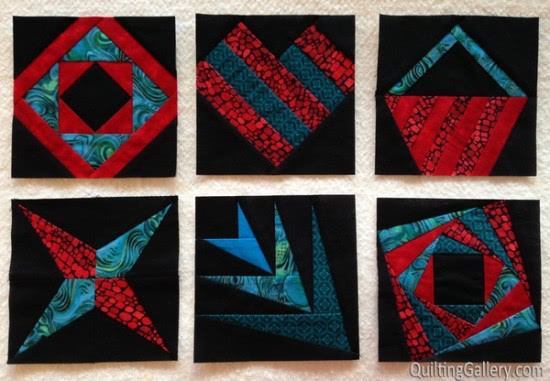 I have often heard quilters say that they find paper piecing confusing and terrifying. In my tutorial, I have broken down the process into four repetitive steps: Fold, Trim, Stitch and Press. I’ve included detailed photos and tips for each step. I also share numerous tips, aimed at the beginner, such as the one shown below on how to achieve perfect and secure points. I’ve had lots of interest in this tutorial on Facebook, so I’ve put together a Booklet for those that wish to learn paper piecing but are not interested in doing the Delightful Stars quilt. The full tutorial IS included in Delightful Stars, so if you are doing that quilt, you don’t need purchase this separately. This booklet is available for purchase as a PDF file that you download right away. 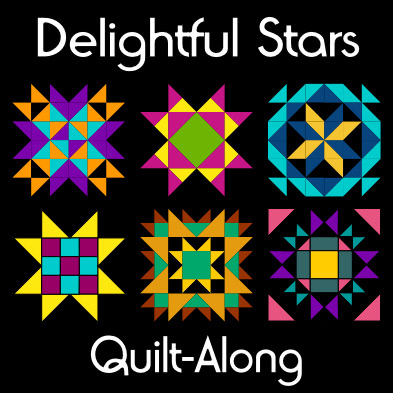 For more info and to purchase the DS QAL, visit the main Delightful Stars Quilt-Along page. You can join at any time and catch up at your own pace. I thought I would share my first paper piecing nightmare. I really am surprised I came to love this technique despite my first experience. These two had so many patches, that I guess I got confused and accidentally added a patches to the outside seam allowances. Once I discovered my error, I was so disappointed after all that work, that these blocks have remained tucked in the back of a cabinet and only saw the light of day recently for me to take the photos. They’ve been returned to their hiding place. One day, I will re-draw the patterns and try again. 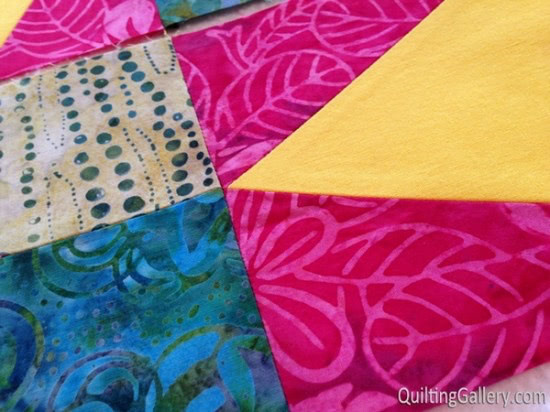 To celebrate worldwide quilting day, let’s have a give-away. Answer the following: What was your first paper piecing experience like? If you haven’t tried it yet, why not? Share a photo, if you like, it’s optional. Share below in the comments and I’ll pick two random winners on Wednesday (March 19th) to win one of my patterns or booklets of choice. If you’ve already purchased and win the give-away, I’ll refund you. This give-away is now closed. Emails have been sent to the winners. Thanks everyone for entering and sharing your paper piecing experience and some photos. I just learned to quilt a few months ago. I have been doing a lot of 9 patch patterns. I have been wanting to try some different ones but, haven’t found anything that is in easy to understand instructions yet. Stars is one of the ones I really wanna try but when you read it in quilting books sometimes it looks greek. I work full time and have my mother-in-law that helps when I can get up to see her. I have a friend that quilts but we can hardly ever get together cause of my work. (I work with special Needs Kids) So it’s very long hours with some of them. I would love this book or any book to help me futher my quilting experience. My first attempt at paper piecing was approximately six years ago. It didn’t seem so hard at the time. In January I tried again at a class at Road to California. It was like Greek to me. I finally got my saw tooth triangles completed with only one fabric sewn backwards. I’ll try it again, soon I hope. If the learning curve goes down in the next six years I better try before then! I began quilting several year ago when I was between jobs but then put it aside as I was pastoring a church full-time. Am now just getting back to it after about 8 years which means the class I took is long faded from my memory. My husband is now partially disabled and has been sewing with me. He has a good eye and can do anything. Thanks to my mother we now have two sewing machines and can work side-by-side. I love star patterns and would a chance to win your book. I have never tried paper piecing! For some reason it really intimidates me, just like FMQ did until I tried it recently! I really need to take a deep breath and dive right in. Thanks for the chance! My first experience was confusing. It ended up with messy back side as I didn’t know I should trim during the process. Once I watched free tut on Craftsy my second try went smooth. Hope to start soon. Gathering pronects – just need more time! I have a wonderful teacher and DS is my first time. Love it. 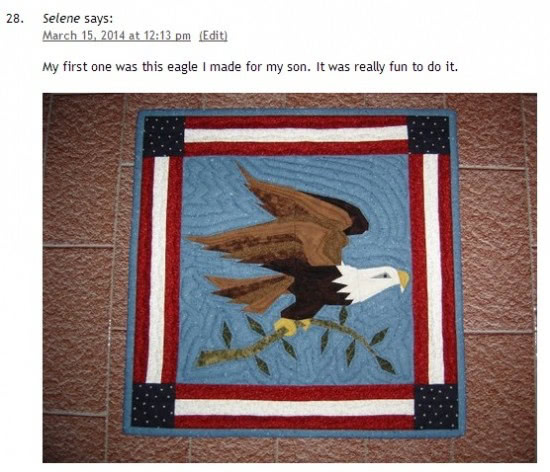 I have only made one quilt. I have not yet really got into making all the different things yet! But I am excited to learn and I think that anything that will make it easier or come out right will be worth the knowledge! 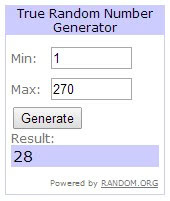 Thank you for the chance to win! 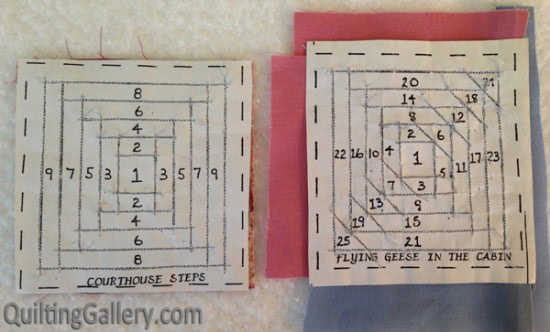 I will attempt my first paper piecing at a class with Deb Karasik in two weeks. I’ve been concentrating on building skills one at a time, and enjoy taking classes to learn new techniques. 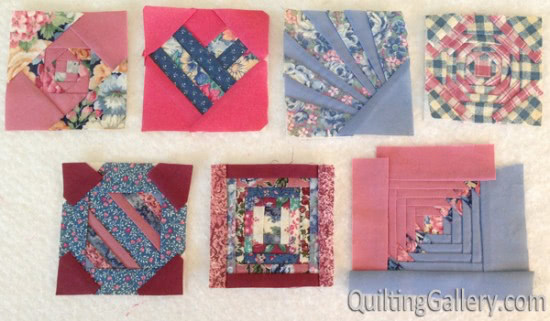 After enjoying the A4A quilt-along, I did purchase the Paper Piecing Tutorial when it came out to add to my library of techniques. My first time was a hot mess. I’ve played around a little more since then but not much. I’m going to try more when I finish two UFO that are late. Haha! Paper piecing? I’ve only done it to make hexagonal designs for cusion covers. I’d like to try more so will start to follow your ideas. My first block that I saw quilting done was the Pineapple paper pierced block and that just got me into quilting and taking a sampler quilt class. I love PP and the pineapple block, going to make it for our bed. Two weeks ago my daughter made a special trip to my house to teach me how to paper piece. I purchased the book “Vintage Quilt Revival” to learn from. I’ve now made every block in the book once and have completed one top (which is on my long-arm now). I was afraid to try paper piecing because it was just so confusing to me. Obviously, she is a very good teacher since I’ve accomplished so much in such a short time. My advise is don’t be afraid to try something new. The very first thing I ever paper-pieced was a foot and foot pedal pattern by Badskirt. I log cabined it into a bigger block and turned it into a pipe for my friend Katy/imagingermonkey. I have been hooked ever since! I taught my mom (Charlene see above) and I’m pretty proud of what she’s done!